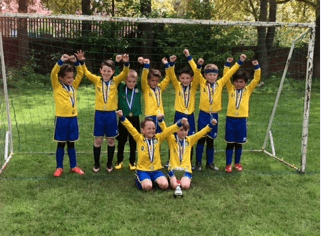 Stockton Town FC U8 Yellows took part in the Thornaby Cup on the weekend of the 15th May and came away deserved winners. After successfully negotiating a group consisting of teams from Middlesbrough Billingham and Darlington, the yellows moved on to a last four match against Tibs. A tight affair was settled with two excellent team play goals from a slick Stockton team who stuck to their philosophy of passing quickly, creating space and finishing superbly to win the game 2-1. The final saw them come up against Normanby who tried to unsettle Stockton with fast closing down, this only made the yellows step up another gear and some excellent possession helped Stockton create numerous chances. The final score was 4-1 to Stockton and the kids celebrated wildly at the final whistle. Captain Zac Greenhough gleefully lifted the cup as each child was also given their well-earned medals. Well done kids you performed really well which didn’t go unnoticed by parents and coaches from all teams, thanks to Thornaby for inviting us down and a big well done to all teams who took part.